The theme of the game involves the concept of time that splits between the present and the future; Pendual itself is a portmanteau of "pendulum" and "dual". The UI features white colors to symbolize the present and purple colors to symbolize the future. The new theme system cycles the theme of the game throughout one to four days and switches between Present and Futre. The in-game clock displays the year as 2014 when in the Present Phase, and displays the year as 2222 when in the Future Phase. Each theme has their own unique features, including songs. Beatmania IIDX 22: Pendual retains the core gameplay introduced in the first game. Players are required to hit notes that fall from the top of the screen at the hit zone using keys or turntables which are required to be scratched. Hitting the notes correctly will fill up the Groove Meter, while failure to do so drains it. Players must attain at least 80% of the meter at the end of the song to pass. It has also kept two gameplay variations that were introduced in Beatmania IIDX 17: Sirius - Charge Note (notes required to be held) and Backspin Scratch (spin the turntable at one direction and spin it at the opposite direction at the end). However, two new options were introduced to the game: An EXPAND-JUDGE option, which increases the timing of the "GREAT" judgment, but the player's score and rank are rendered invalid; and Rotational-RANDOM option, which shifts the hit notes to the left and right depending on the setting. Players were also given a choice to display their EX-Score instead of their combo during gameplay. Chrono Seeker is the first unlockable event of the game which started on October 1, 2014. In this unlocking event the player must collect Crystal Shards for each respective Time Phases via each playthrough ("Present Phase" on the left, and "Future Phase" on the right). Each one of the Time Phases has a different condition to unlock for each gemstone row while on different difficulties ("Present Phase" has unlock conditions based on playing the songs, while "Future Phase" has unlock conditions depending on the Time and Date Settings). Completing the Crystal will unlock the song on the "Chrono Seeker" folder (accessible on Final/Extra Stage), and playing the song once will unlock another gemstone row and the song for regular play. The opposing side on the same row unlocks the Console and Revival Songs, but was instead unlocked for regular play immediately. When the player gathered all the 12 crystals for the time phase (or getting more Crystals than the other time-phase) and playing all the four songs at least once will unlock the fifth gemstone row for the respective time phase. To unlock it, the player must play the songs based on the artists (Master in "Present Phase"; or L.E.D. in "Future Phase") in one credit after playing through all the songs under the respective version folder at least once (PENDUAL for "Present Phase"; or the version matching the Month Number for "Future Phase"). This will then unlock the boss song on the "Chrono Seeker" folder which are exclusive to the time-phase (Symmetry in "Present Phase"; or NEO GENERATOR SEVEN in "Future Phase"). Unlike those songs, they are not unlocked for regular play. If the player gathered all 30 crystals (15 for each time-phases) and played the boss songs at least once, the last gemstone row will appear. To unlock it, the player must input the Konami Code on the game keyboard (in order, EFFECT button twice, VEFX button twice, 1P Start Button once, 2P Start Button once, 1P Start Button once, 2P Start Button once, any of the Black Keys and White Keys), and then play the songs in relation to GRADIUS after playing at least one song from each game folder at least once to unlock Broken Sword in the "Chrono Seeker" folder. Playing Broken Sword once will mark the event complete and the boss songs (Symmetry and NEO GENERATOR SEVEN) can now be played on all time-phases. The unlocking system which unlocks the One More Extra Stage was started on September 24, 2014. To access it, the player must attain a Full Combo with a higher grade while playing exclusive songs on the Time Phases. The gate will then be activated and will appear on subsequent playthroughs during the game's Final Stage. Afterwards the player must Full Combo the charts with a higher grade during the Final/Extra Stage (depending on the difficulty the player cleared for activating the gate, the grade maybe lower for higher difficulty). Depending if the player succeed in Full Combo a chart or not, the door will change time phases (thus the unlock conditions must be repeated while on other time phase), but failing to do so will lose a chance (billed as 'Challenge Chance') to unlock the gate (and doesn't count towards the total Full Combo Count, each successful Full Combo will produce lightning effect). Failing to Full Combo three times will cause the gate to disappear. 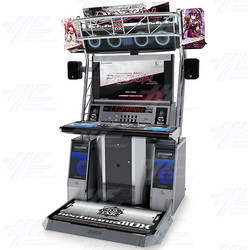 When the player subsequently Full Combo three other charts (previously nine before November 5, 2014), the door will open and the player immediately access the One More Extra Stage automatically upon the difficulty the player triggered the door (forced to play on EX-HARD gauge). PLEASE NOTE: This machine must be connected to the Japanese Server and you must pay a regular subscription fee in order for the machine to work. If you do not do this, the machine will not come on.